It's with heartfelt thanks and appreciation that this post is dedicated to all those who have died fighting for our country's freedom, and for those who are continuing the fight on our own soil and abroad. 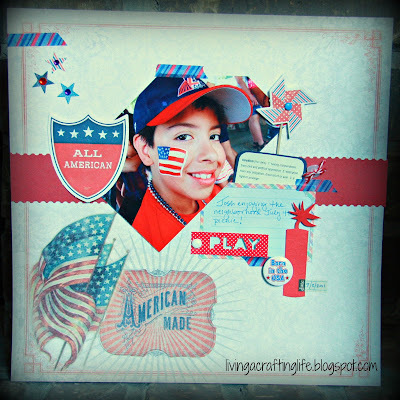 Today's layout is a patriotic one that I finished last week. The photo was from an Independence Day celebration in our neighborhood, but nonetheless, an All-American layout it is. The paper is a sheet from the My Minds Eye "American Made" collection from a couple years ago. 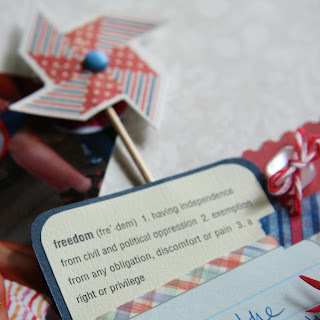 I added diecuts from the line, as well as various bits and pieces that I had, including some flair and a Creative Memories diecut (the firework). Washi tape and some bling were added to make it even more festive. We may be American Made, but it is the freedom that is fought for that makes this country truly great. Thank you, Men and Women of our Armed Forces - you are loved and appreciated for your sacrifices.